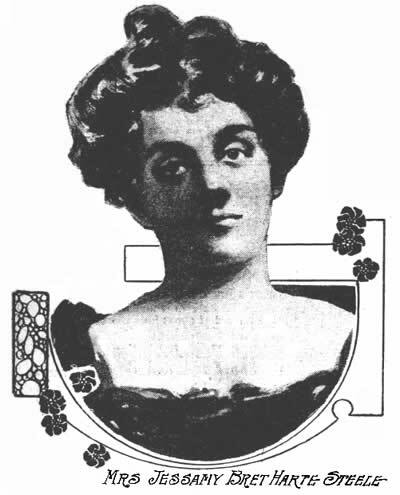 PHILADELPHIA INQUIRER, February 2, 1907, p. 6. NEW YORK, Feb. 1. - Memories of the feud between Mark Twain and Bret Harte were revived today when the humorist announced that he would not attend the benefit performance that will be given by Miss Eleanor Robson for Mrs. Jessamy Harte Steele, the destitute daughter of the dead poet. "If the use of my name, as a patron of the benefit which Miss Robson is to give for the daughter of Bret Harte, is of any value to those interested in the matter they are welcome to it," said Mr. Twain today. "Further than this I will not go. It has been my habit this winter to decline to participate in anything of the kind, unless I have felt it to be a most urgent duty. I do not feel that it is in this case. "I was never an intimate friend of the Harte family, and have not been thrown into contact with any of them for thirty years. "Perhaps, if Bret Harte's daughter in her present plight were a single woman I might feel it more of a duty to aid her further, but as the case stands, I do not intend and will not attend the benefit performance or occupy a box, as has been stated." The feud between Mr. Harte and Mr. Twain was the outcome of the story of "Calaveras Frog" related to the poet by the humorist. Mr. Harte published it under Mr. Twain's name, and following that the literary pair never spoke to each other.